Something that I would like to share with my girl friends!! 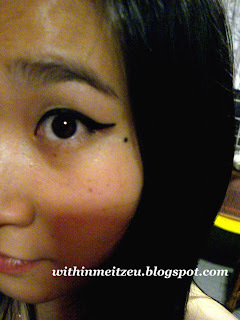 Last week, I've bought a gel eyeliner from Cosway with promotional price. Although I'm loving such dramatic make up, but I'm not daring enough to put on it at first until the second attempt with thicker eye line. I like the eyeliner drawn by Amy Winehouse!! But her's thicker than mine and longer in the end of her eye line. 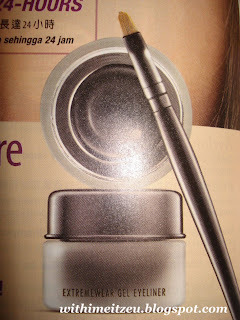 Pic: L'elan Vital ExtremeWear Gel Eyeliner. The texture was ultra-smooth, soft and creamy. Besides, it was waterproof and sweat resistant for all day long. (It's true and I tried for hours). Fast dry texture when applied on our eye.